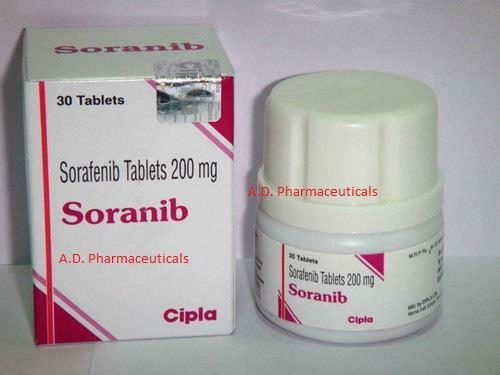 Soranib (Sorafenib) is used to treat cancer occuring in the kidneys (renal cell carcinoma) or liver (hepatocellular carcinoma). It works by inhibiting the action of the enzymes that tell the cancer cells to grow and multiply, while also stopping blood vessels from growing within the tumor, thereby preventing the cancer from growing. We are pioneer supplier of Soranib 200 mg to Russia. Soranib (Sorafenib) tablets are swallowed whole, with a full glass of water. They should be taken on an empty stomach, at least 1 to 2 hours after a meal. The exact dosage varies, depending on the condition being treated as well as the patients response to treatment. Patients should consult their physician before taking this medication in order to determine the correct dosage. You should never exceed the dose recommended to you by your physician.